Our range of products include impact bars. 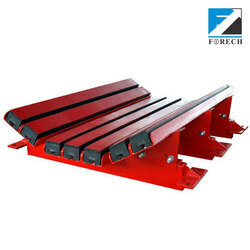 FORECH-HILTON Impact Bars are designed to absorb impact at the loading points of Conveyor Belts, where a combination of high energy absorption and low friction is needed. Due to ease of installation, these Impact Bars replace the conventional idler sets. The top cover is made of an Ultra High Molecular Weight Polyethylene, which gives these Impact Bars a very low friction top surface. The middle portion is a high-quality energy absorbing rubber, which acts as a shock absorber at the loading zones of conveyor installation. These Impact Bars are also available with tapered ends on one side or on both sides to prevent any damage to the conveyor belt. FORECH-HILTON Impact Bars come with a ‘T-Track’ fastening system, which enables variable ﬁxing points throughout the length of the Bars. A ’T-Track’ fastening system also makes the element adaptable to any cradle arrangement, which the conveyor installation might have.The Impact Bars come in standard lengths of 1220mm, 1500mm and 1524mm with the top cover of UHMWPE and are supplied with 8 bolts and Nylock nuts as a standard accessory. Special sizes of Impact Bars are also manufactured on special requests.